I recently posted about my personal costs for reloading. In this discussion I only accounted for the individual costs of making each round. IE how much it costs in lead, powder, brass, lube, polish, and primers. What I DID NOT account for was the initial cost of all the equipment that now occupies 35% of my garage space. The purpose of this post is to do just that. I acquired almost all of my equipment new and out of the box so keep that in mind as we go through this together. Nothing wrong with being thrifty!! I got all the bells and whistles from the blue catalog. The "as pictured" version straight from Dillion. Pros- ammo production- by myself I can crank out roughly 500 rounds/hr on this machine. I stop every time I refill the primer tubes and do a powder, primer, OAL and diameter check. With a second set of hands I can get over 1000 rounds/hr no problem. With someone feeding the brass in to the case feeder, adding primers, and refiling the bullet tray all I have to do is keep an eye on powder checks and pulling that lever. In between those acts they are also doing the visual round inspections, marking brass, checking for high primers and putting rounds into ammo boxes. Team work makes the dream work. Cons- opportunity costs- the 650 with all the bells is the same price as a pair of Ruger NV, or a new 1873. It is expensive. -space- its big. mounted on my table its almost 7' tall at the top of the brass feeder. its not exactly mobile. I have mine mounted on a moving table but the loader itself isn't very easy to move once its bolted down. - location- I do not load in my house. I do it in the detached garage just in case something goes wrong and there is a fire/explosion. - initial setup- this took almost a week to get up and running fully. There's lots of trial and error, frustration of getting it exactly right, and learning from your mistakes. Lots of crushed cases, sideways primers, powder flakes, and alarms beeping at you. Pros- This is a great starter kit. Comes with everything you need to get started. If you have a box of spent brass and get this you will have clean and ready to load brass in about 4 hours. - I've polished about 2500 cases without replacing/cleaning my media. Its not very loud and doesn't take up much space. - If you powder coat your cast bullets this will double as an applicator system. - fair price for all you get. - its messy. no matter how hard you try you are gonna get media on the floor. Once it hits the ground it shouldn't be reused on your brass. - I can only fit about 500 38spl cases in at a time. If you're going through more than that on a regular basis you might need a larger system. So if you are looking at casting your own you have to have your molds. Lee 6 cavity are the way to go. as long as you keep them well maintained they will keep dropping good consistent bullets. Lee 20# lead pot $105 with shipping on amazon. again, if you are casting your own bullets, this little guy is a good start. Its not perfect but short of commercial production it does quite well. Pro- durable and reliable- I've dropped it, its been rained on and bounced around in the bed of the truck for hours. Its tough. Con- space- you gotta be either outside or in a VERY well ventilated area. I DO NOT recommend doing this in the house. lead drips and splatters out of the spickette and leaves these tiny little droplets all around the pot. It just happens. Glasses, gloves, long sleeves, respirators. $50ish wherever you so choose. These are at your discretion. Your safety is in your hands. Don't skimp, especially on the glasses. If your primer tube catches static and blows or your get moisture in your melting pot and it pops your eyes are kind of irreplaceable. you will quickly realize as you make more and more different types of ammo, cast more bullets, sort brass, etc you will need a place to put it all. medium size air tight Tupperware because I don't worry about moisture seeping in or hazmat seeping out. I started out just reusing old 50 round ammo boxes but those are neither waterproof nor designed to last very long. 8. Single Stage press and Sizing Die- $64 on amazon. If you cast bullets you MUST resize them. So I got the little single stage press and it works great. Pro- you have to size and this is the best setup. You can also pop the dies out and do some individual loads. Cons- sizing takes time. its an extra pull of the lever, but you gotta do it. $1768. initial start up costs over the course of about 2 years. Buy quality the first time and it will be the last time you have to. Discover lizard litter from your local pet supply store. It's less expensive than the brass polishing media sold by reloading supply outlets. Your single stage press will prove very handy for many tasks. I use mine for loading small lots of rifle ammo. Besides helping save you $$ on ammo costs I find I now look on casting/sizing/powder coating bullets as well as the reloading operation itself as separate hobbies which I greatly enjoy. No need to make a trip to the range to shoot as I can do these at home. Moe, Great post. Yep, there's more costs to reloading than just brass, bullets, primers, and powder. I'm with you, if you match your press to your needs, reloading still saves you money in the long run. It would be silly for me to buy a $1,250.00 press to reload 3,000 rounds a year. My used Lee 4 hole turret (that I got with dies, disk system, and some extras for $100.00) has served me well. After the first 25 years of reloading-You'll be glad you have it. Lumpy, that picture of you doesn't make you look any older than 25! each activity lends to its own learning and growing. definatly a cool feeling knowing that I made what is going down the barrel! Most definitely! I have finally gotten into the groove and am in a place where I can shoot twice a month at matches plus taking friends to the range. I figure I will load till I run out of something. Personal goal is 6k rounds. that's 50 6 stage matches that require 10 pistol and 10 rifle. Should be enough for at least a season!! Michigan Slim.... Same for me!!! As a shooting buddy once told me, repeat this prayer regularly .... Dear Lord, when I die please do not let her sell my guns and reloading stuff for what I told her I paid for it! and comes out a lot cleaner. Some folks here told me about it and 10 times better than dry media plus safer. Slim, All you got to do is tell her that it's not a cost, it's an investment. 1st, it pays for itself by saving money on ammo. 2nd, when you sell it, you'll get almost all your money back. Heck, if you keep your Dillon press long enough and they keep raising prices, you can sell it for more than you paid for it new. Don't need the expense of buying plastic containers for components... do you drink coffee... eat ice cream? That's just two products you already buy that comes in resealable containers that I've utilized for years, for keep dirty brass, then clean brass in. +1 on the coffee "cans". I know they are not cans anymore but those plastic buckets work great! I started reloading 25 years ago with a Lee Anniversary Kit. Not a huge investment and learned a LOT about reloading. The internet wasn't even a thing yet so I talked to many people about what they did (and didn't) do to make their ammo. I collected pieces here and the to make things better and moved to the Lee Breechlock setup. Much faster to change calibers and everything stays the way you set it. I cranked out thousands of rounds on those Lees and always had quality, dependable ammo. I have heard over the years how amazing the Dillon products were and how the company stood behind everything they sold, just didn't want to make the investment. Well, only one kid left in the house and I am now a proud Dillon owner! YES... It is AMAZING!!! Quality and capability. If you know next to nothing about reloading, READ... read a lot about what to do and what not to. Then start with one caliber and a setup you can afford that still provides quality; there are many out there (Dillon, Hornady, Lee, Lyman, RCBS...) Dive in and have at it. 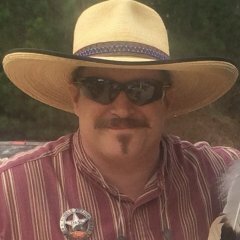 Ask questions, of the reloading companies and others that are reloading. You will hardly find someone who isn't willing to share their experiences. Now go save money and have some fun doing it. Oh yeah... then ya get to go shoot it up! Coffee cans...5 gallon buckets....28 gallon totes...I use them all. I scared myself recently when I realized how much empty brass I've accumulated over the years. Been reloading since the mid 1980s. My first press was was a Lee Pro 1000. After seeing how hard it was to change from one caliber to another, I sold it and bought a pair of RCBS Jr. presses...I still have one of those. I picked up a Dillon 550B from a friend who was starting a business and needed some money. The press, dies for 38/357 and 45 acp, several thousand brass for each, powder and primers cost me $600. I picked up some used bullet casting molds, and a Lee bottom pour pot, and started casting bullets in the early 90s. When I got into Cowboy shooting in 2004, I quickly saw I needed to load my own shotgun shells. I picked up a Pondsness Warren DuoMatic 375, from a cowboy on the SASS Classified wire. Later, I bought an old Pacific loader at a yard sale. I use that for slugs and specialty shells. As I went through this process, I picked up accessories and literature on reloading. I have numerous manuals. Looking last night, I realized I had 4 powder measures (3 RCBS Uniflows and a Lee), 4 sets of scales (2 beam and 2 digital), 30 plus sets of reloading dies, primer tools, case prep tools, and the list could go on. So, I have invested a substantial amount of finances and time in one of the finest hobbies I've every participated in. I enjoy reloading almost as much as shooting. 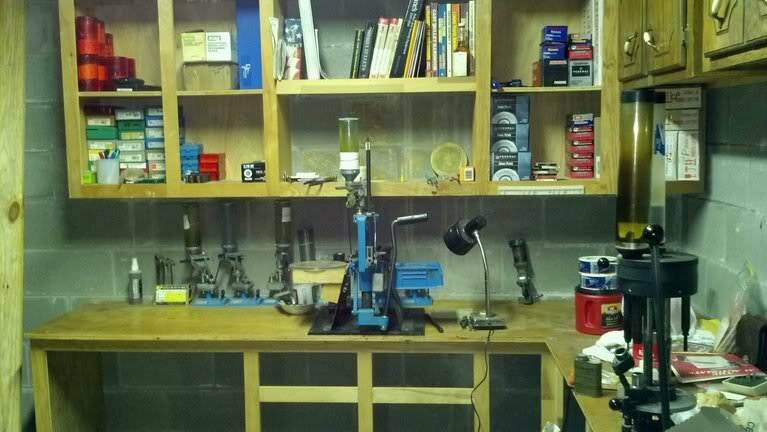 This is an old, way too clean picture of my reloading area. It's got a lot more stuff there now..a lot more. And the cabinets have had three drawers added that are not in the picture. I bought a lot of my stuff 20 years ago and added a better press 10 years ago so it wasn't a big hit all at once. If I figured out how much money I have saved loading for all I have shot since then...…..it's well worth it for me. Plus when people couldn't find ammo I was still up & running...…..that's a hidden jewel. My setup isnt as extravagant as yours but it's already paid for itself in a years time. I only load black powder rounds so the high speed chicken feed set ups really cant do the job. But I find it relaxing. I'm able to crank out 100 rounds an hour. My setup isnt as extravagant as yours but it's already paid for itself in a years time. I only load black powder rounds so the high speed chicken feed set ups really cant do the job. This statement has already been proven false. One can load Black Powder progressively. Well if you're into taking risk go ahead and run black powder through a hopper made for smokeless. Me, I'll continue throwing mine through a long brass spout. Not gonna bet my house and family on something not tried and true for generations. Well if you're into taking risk go ahead and run black powder through a hopper made for smokeless. Me, I'll continue throwing mine through a long brass spout. Not gonna bet my house and family on something not tried and tried to for generations. There are brass powder measures and grounding straps...if it were up to you we would still be carrying gasoline around by the gallon. Yes I suppose there are other ways to do it safely. Maybe saying they can't was a poor choice of words. But are you here to add quality content or just to give me a hard time? I'm not here to argue just thought I'd share my initial setup and actually see the #s written down. Red Folgers cans for all shotgun stuff, Blue Maxwell House for all my Dillon stuff. You’ve obviously focused on the monetary aspect of reloading. An intangible that people sometimes forget about is the ability to customize ammunition to whatever sport you’re participating in. Loading your own also allows you to tailor your ammo to your guns. The value of these can’t be measured, but it’s BIG. Haha, I don't drink coffee either, but when folks find out you're using them, you'll have em comin out your ears! And Slim's right, the color coding for different stuff is kinda cool too. I'm not trying to give you difficulty, but I cannot abide entrenched untruth. You want quality content? Ok. Most reloaders fail to consider their own time when they consider the cost of reloading. I started out on my kitchen table with Lee Loader Kit tapping out .38 Special at 50 glorious rounds per hour. It was an absolute pleasure to work with my hands and perfect the touch necessary for a uniform crimp. I still load my .357 Magnum and .243 Winchester this way. I hybridized the kit pretty quickly with a hand priming tool. I then started to figure out that I could make more ammunition faster by using a single stage press. It's hard to say how many rounds an hour I could make doing this because I would break the stages down over different sessions for maximum efficiency, but on the seating session a lot more than fifty came out. After a while I migrated to fully progressive reloading. I wish I had done it that way from the start. Dillon is very expensive, but a truly smart move from the outset would be to go fully progressive from the start. Dillon 650 from the factory with all the bells and whistles. That is the most cost effective means to reload considering your personal time as a cost. If you can't pull the trigger on that, buy a Lee Loader Kit and make do while you save your money for the Dillon. Skip wasting your time and money buying all the extra stuff along the way. Except for low volume rifle rounds, the single stage is a waste of time. FWIW I load all my BP rounds on my Dillon 550, and my MEC's. I have only been doing it for the last 15 years, and I only shoot 2-3 times a month, but so far, no problems. 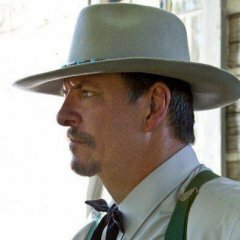 I watch the gun boards pretty close, and so far I have never heard of anyone having a safety problem with BP and progressives. I do hear about primer tubes blowing up, and guns blowing up, but not any Dillon 550's blowing up due to loading BP. So I have to conclude it is an old Wive's tale. Kinda like you have to clean your BP guns within hours of shooting or they will turn to rust. Another lie. So, back to the subject at hand, if I didn't cast and load my own, my wife, 2 kids and I would not be able to shoot SASS matches more than 6 times a year, as my budget is pretty tight. This is especially true for the Blackpowder rounds, as they are even more expensive if you have to buy factory. Except for low volume rifle rounds, the single stage is a waste of time. I would respectfully disagree. If you have very little or no reloading experience, I think a single stage is a great place to learn. Understanding each facet of reloading is really important so as not to have major problems later. 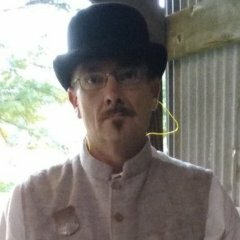 Getting each stage of the process understood and perfected separately really helped me get repeatable, consistent loads for years. And you can always (like you said) use the single stage for low-volume stuff later. Which is why I believe in the Lee Loader Kit. I load all my .243 Winchester that way. It's perfect for accurate loads. It held the long range record for years. I already had the 2x4 and the rubber mallet. The secret is a heavier mallet and using the weight to do the work. Everything is possible to fit in a shoe box. No need for a mount or dies. Gotcha. I was just thinking that an actual press, but not the full blown Dillon was a good lead-in. I use my RCBS Junior regularly when I'm testing new loads, or getting the feel of a new caliber. I was trying some new to me powders this last week, so rather than set the 550B up, I did it single stage. After I work up my load data, then I'll set up the 550B. I see what you're going for, but I feel it's like having a candy bar for breakfast. Good in the moment, but leaves you wanting later on.